Brenda Priddy, the femme fatale of car spy photography, got us one heck of a scoop today — real, live and non-blurry photos of the new Volkswagen pickup truck tester. We've been told this mid-size hauler will be called the 2010 VW Robust in certain markets, but that's speculation as of now. What's also speculation is whether we'll end up seeing it here in the United States and of course whether the new four-door pickup from the brand all about "Fahrvergnügen" will end up hitting showrooms as a 2010 model year product. What we do know is current plans are for it to be built in Hanover, Germany as well as Argentina. Full spy report from Brenda Priddy below the jump. VW's All-New Pickup Truck Caught! You've seen test mules, and blurry pictures from what seems like miles away - but here's a running prototype - and we're as close as one can possible get (at highway speeds) to the all-new pickup from Volkswagen. The mid-size truck - this one sporting a quad-cab - will be built in Hannover, Germany, as well Argentina, and has been referred to as the Robust. 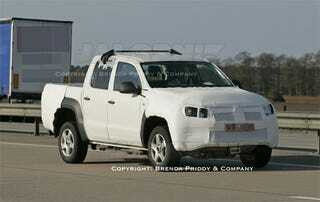 Sources say two-wheel-drive and "off-road capable" 4x4 versions will both be offered! The 2010 Robust will be a global product - but VW is still mum on their plans for U.S. sales.